February | 2009 | okay, peanut. I know, it’s been a while. After returning from Grand Cayman, things have been hectic. I got in around 2 am on Wednesday morning and had to catch up from there. At the end of the week, Justin left for Daytona. Since then, he’s been working 12+ hour days, and is spending this snowy Sunday at the office, too. Joy! Despite my disappearance, a lot has been happening! We’ve finally finished our registries. It’s so hard to choose things you have absolutely no experience with. Progress on girlfriend’s room has been great! The subfloor is completely done, closet storage is finished, all closet doors are installed, and only one of those doors is waiting to be painted. The remaining big projects in her room are to replace the windows (We have them, just waiting for a warmer day. ), paint (more on this later), install the hardwoods, and paint & install the door to her room. Oh, and the changing table (also more on this later). In case you weren’t aware, this room was formerly used as storage. It’s been quite a challenge to clean out and organize. We’re so lucky the shed is finally built, because before the shed, this room also housed lots and lots (and lots and lots) of tools, as well! Now the only challenge is to figure out what to do with all of my stuff – crafts, frequently used items, and things that can’t go in the attic because of the temperature extremes. With a dirt basement, that option is obviously out. We’ll just have to get creative! We actually decided on a paint color! The room is currently yellow, so it had to be changed. Justin wanted to either leave it yellow or paint it white. Does he not know his wife?! I got paint swatches from Benjamin Moore and left them sitting around to warm him up to the idea. I then selected three colors that match the fabric I’m going to use for her curtains. 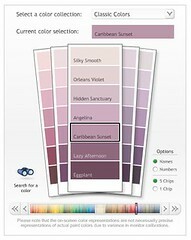 He agreed to Caribbean Sunset – it’s a lighter version of an eggplant color. Sweet! This weekend might be the start to the painting. If not, it’ll be in the next few weeks. Yay! What other updates did I promise? Oh, the changing table! Our plan was to use a short dresser as her changing table; no sense in spending on something that has such limited use. 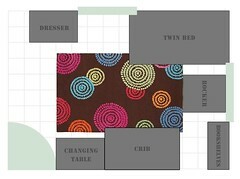 I did an online search to find out what typical dimensions were (I have a computerized room layout and needed to know what to plan for; I know, I’m psychotic. ), and saw a google listing for a changing table that folds into the wall! Yeah! As long as there’s time, this is the plan. It’s a great space-saving option that can be used for other fun things later on! I’m updated out, so I’ll update a little more later. As of now, we have 11 weeks and 3 days until girlfriend’s due date! I’m getting so anxious to meet her; it’s crazy. I haven’t been sleeping well for several weeks now, and I know the best is yet to come. I’m also starting to have those days where I’m just plain uncomfortable – today is one of them. Nothing I do makes me settled. Aah, the joys of pregnancy. I can hardly wait until I get Fiona feet and hands – now THAT sounds like fun! Have a great day! Lots of love!